Paige takes a page from her own book and brings her chandelier family into sconces and vanities. Clean and easy going describes this fixture. A Simple Satin Nickel Frame With Compact Opal Glass Shades. 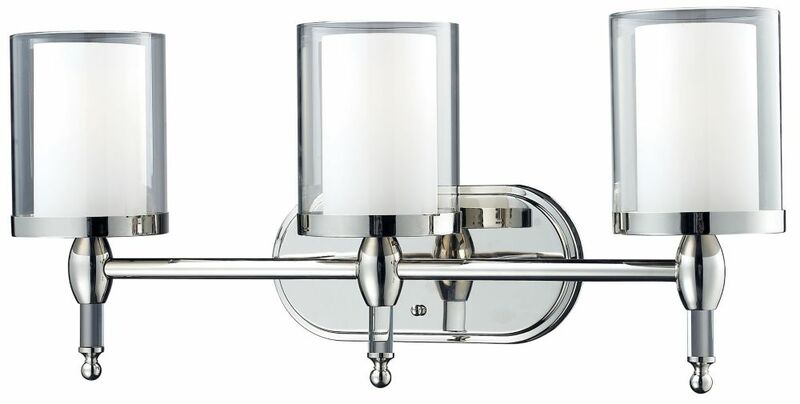 The CARLO 3-light vanity features a brushed nickel finish with opal glass shades. The schoolhouse glass is retro but decorative. This downlight is perfect for your bathroom or powder room. 3-Light Chrome Vanity with Clear and Matte Opal Glass - 6.25 inch This vanity light will update your home with its eye-catching design. Featuring a chrome finish and clear outside; matte opal inside shade(s), this fixture will accommodate a variety of dicor styles. With its easy installation and low upkeep requirements, this vanity light will not disappoint.